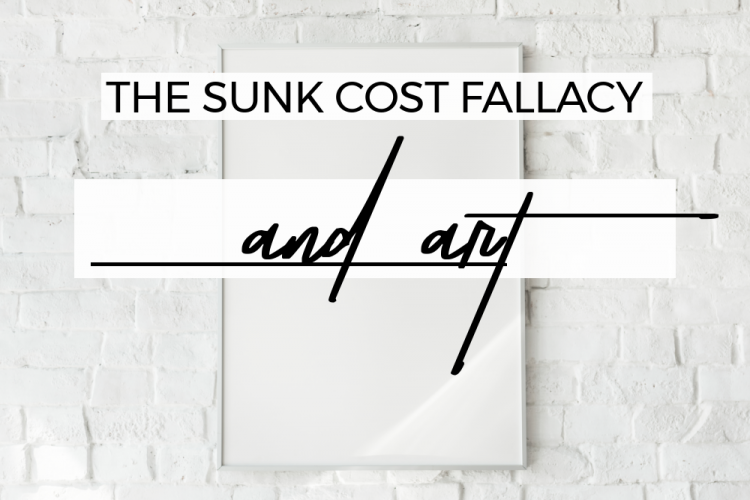 Recently I’ve been thinking about the sunk cost fallacy and how it relates to art and artists. The sunk cost fallacy is (in my own boiled-down definition) a misconception that drives us to hold on to bad investments because of the amount we’ve already invested. That might be an investment of money, time or just emotions. Sunk costs are what we’ve already poured into a project or activity. It doesn’t have to be complicated – if you’re anything like me, you’ll have found yourself sitting in front of that awful tv show far longer than you wanted to just because you’ve watched so much of it that you might as well see what happens in the end, or else it’ll be a waste. Actually, you’ll have just wasted even more of your time on the show, because no matter what, you can’t get that time back! Whether the time was spent or wasted, it’s gone. So do you want to spend/waste more time on it? It has a lot to do with another common cognitive bias – loss aversion – where we care more about what we could lose than what we could gain. So what does this have to do with art? Thinking rationally about making art? Let’s face it, many artists are bad businesspeople – some because they naturally are that way, and others because they’ve listened to the cultural cliches surrounding creativity – you know, pitting logic against creativity, as if there are only two ways to be. When it comes to the process of making art, stepping back from the emotional aspects of decision-making isn’t encouraged much. It feels too much like stripping art of its entire purpose. 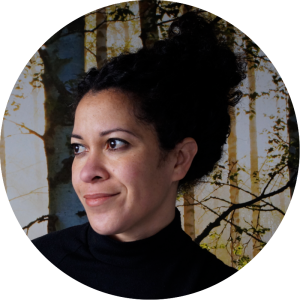 But we might be better off trying to analyse our personal processes and asking ourselves whether we work in the ways we do just because our younger selves set us up to be this way. All of us have those pieces that we don’t want the world to see. It would be impossible to create enough good art to get you anywhere without creating an ocean of bad art in its wake. Unfortunately for me, my mum has assiduously hoarded my avant-garde secondary school efforts and actually displays them at her house. And… I also sent some of the worst bombs out to the internet, so that’s on me. If you feel hurt every time a painting or sculpture doesn’t work out, then you’re not a failure; you’re just human. But you can’t take the pain to heart, and you can’t take it personally. I speak from experience when I say that I stress out when a painting looks as if it’s going off the rails. Every time. Sometimes it comes around, but sometimes it doesn’t. The thing to do is gauge whether you can use this as a learning tool – as a piece to practice your technique without condemning yourself as a failure – or whether you can recycle it into something else. Or whether it will just sit there for years, condemning you. Making that decision won’t be easy for some of you, and I know that because it isn’t for me! If it’s just going to sit there looking at you like a judgemental in-law, chuck it in the bin, for goodness’ sake. No-one needs more of that. Are you betraying your former artist? That art was a stepping stone. You couldn’t get here without having been there. You sunk the time and money into it, but you can’t get either back – maybe you think you can get the money back by selling it, but will you really? I have a few bags left over from when I ran a craft business. Some are in a style that I don’t want to use myself, so they’re no good to me. I don’t have the energy to put into a craft Etsy store. I’m keeping them in my studio… but I would rather get rid of them. But I feel bad about getting rid of them because of the time I spent in making them, and the material cost. Keeping them isn’t costing me rent or actually making my mortgage any more expensive, but it’s cluttering up my workspace and making me feel divided every time I see them. 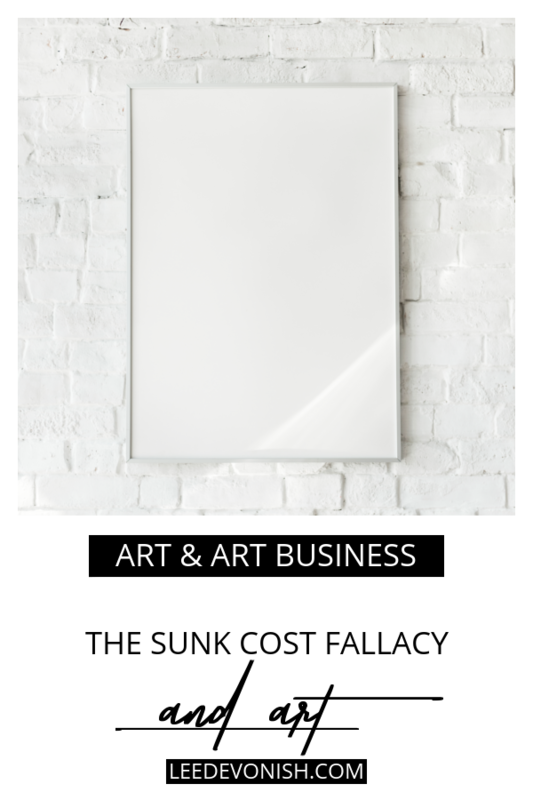 Don’t let the sunk cost fallacy turn you into an art materials hoarder. You know what I mean – keeping every scrap of every thing that could be turned into an artwork, even if you don’t work in that medium and aren’t likely to do so any time soon. Yes, I’m talking to myself again here, because I always want to make all the things. If your resources aren’t actually going to help you move forward with your next project, then they’re actually a drain. Do something with them now or sell them on. My MA course materials are still on the shelf because they’re a great resource for the book I want to write. Yes, yes, the everlovin’ book. I paid a fair amount of money for the course so I want to get my money’s worth by making use of the texts I received. Makes sense, right? But right now I know I don’t want to write that book any more – I have a specific text in mind that has nothing to do with the courses I took. I can always buy the books I need to research, or better yet, start a new course of research full of the new knowledge that’s come along since I was a student. Here’s an interesting one that I wouldn’t have thought of on my own: our social media accounts are a gift from our former selves – do we want to keep them up or say “no thank you” to that gift? This is courtesy of Seth Godin’s “Ignore sunk costs” podcast episode, which I’ve mentioned here before. I’ll admit that this is an area that confounds me. I know I have to do it, but often I feel as though I’ve taken on way too much in terms of my social media footprint(s). Because I’m an introvert at heart and it takes a lot of effort to do the whole social media thing, I find it hard to think about chucking away even a meagre presence on a platform that I spent time building in the past… even though I don’t love being there. Throw the junk away, it’s ok.
It’s not a betrayal. It’s taking up space in your studio and in your head. You Are Not So Smart has a great article about sunk costs and how Farmville can help you to understand how it works. If, at the end of it all, you realise you just can’t think rationally when it comes to your art, then welcome to the clubhouse. Making art isn’t a rational exercise – it’s highly emotional, personal and irrational, and that’s what makes it meaningful, and worth so much more than the sum of its components. So perhaps we aren’t just going to snap out of this cognitive bias, but we can use what we’ve learned to throw some of our junk away.